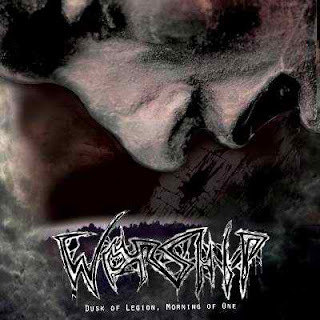 Luego de 3 años los alemanes Worship están próximos a lanzar su nuevo trabajo titulado Dusk Of Legion, Morning Of One. Este nuevo álbum, sucesor de Terranean Wake y el tercero de su carrera, saldrá a través de Weird Truth Productions, aunque aún no hay fechas confirmadas, se espera que sea dentro de lo que resta de este año, probablemente en Noviembre. Así como aún no hay fechas tampoco hay temas de adelanto para saber como se viene lo nuevo de los Funeral Doom alemanes, pero según la info de su sitio nos da una idea de como sería el "Dusk Of Legion...", solo queda esperar y que toda esa descripción se sienta al momento de escuchar los temas. "Right after our 2012 tour with FAAL, I started writing on our next album, inspired by the adventures and on-stage highlights of that wonderful tour (which was a turning point for us). 3 years later, “Dusk of Legion, Morning of One” is about to be released! Because of the live influence, there are more riffs and more dramatic moments. For the first time, all our musicians will also play on the album (less work for me!). The range of moods and paces is slightly raised, some new well-blended elements will meet our faithful foundation. Songs are pretty much packed full of ideas, without losing sight of what we really are, I hope you can feel 3 years of fat-trimming and polishing. 5 Songs (+Intro) take you on a solitary messiah/pariah journey to the early hours of mankind & the birth of its fatal Flaw, falling from the heights of Creation through the deepest valleys of despair." Buscando lo que se viene en la escena doom mundial llegué aquí y el nombre del blog me suena conocido. Hay entradas bien antiguas así que supongo que vienes dándole al ritmo lento hace tiempo ya.